CarGurus has 185 nationwide V8 Vantage listings starting at $34,600. Many people most associate the Aston Martin brand with the V8 Vantage. Although Aston is a low volume, custom manufacturer of rare vehicles, this Aston Martin may be the least rare. It can also be the least expensive. The V8 Vantage spans a line of coupes and convertibles available in a variety of trims and states of tune. One can get into a new V8 Vantage GT Special Edition for about one hundred grand, which, for the affluent exotic car buyer, may just be the magic number for a budget. The V8 Vantage, and particularly its GT Special Edition trim, is in no way less of an Aston than than more expensive models–unless a V12 is important to the buyer. On-road or on-track, the Aston Martin V8 Vantage has more than enough performance to meet the needs of all but professional drivers, and it has the gravitas and panache to be the perfect date night car. The 2015 Aston Martin V8 Vantage comes with a naturally aspirated (no turbos) V8 engine displacing 4.7-liters. In the V8 Vantage base trim, this engine produces 420 hp, and in the GT Special Edition and V8 Vantage S models, that number bumps up a bit to 430 hp. The V8 Vantage line offers two transmissions. On the V8 Vantage base trim and the GT Special Edition, one can choose between a six-speed manual or Aston Martin’s seven-speed paddle-shifted automatic, called “Sportshift II.” Having not driven the car, we will not bad-mouth the automatic, but when researching, you may notice others are not as polite. Notably, the V8 Vantage S is only available with the Sportshift II automatic. In terms of performance, this V8 Vantage in any of its forms will provide its driver with more than enough thrust and parry to be used on any public road. 0-60 time measures at about 4.6 seconds, and the top speed of these cars approaches very close to 200 mph (but not quite). A person buying a car similar to this configuration can get these numbers and specifications from any number of automakers. Lexus, Chevrolet, Dodge SRT, Ford, Audi, Mercedes, and others offer similar cars for less money, but none, obviously, will be an Aston Martin. It has to matter to the buyer that this car is an Aston, or the V8 Vantage becomes hard to justify. The same can be said of Maserati, Jaguar, and other near-supercar brands. The Aston Martin V8 Vantage shines with its light weight. Its 3,600 lb curb weight is an accomplishment made possible by the wonders of aluminum, magnesium, and composite materials. For a Grand Touring or sports car, light weight equals capability, and the drive reports all say this car has that in spades. Still, the V8 Vantage muscles around a course. It is not a ballerina. The look of the V8 Vantage also stands out among the crowd. Some cars, the Lexus RCF for example, are very polarizing. Some love the look, but others can’t see the beauty. The Vantage is one of those cars that just has a classic look to it. Like a Maserati, an Aston Martin is a car that has a distinct look and executes it, resulting with a vehicle that causes car-lovers look at and whistle. Aston Martin offers the V8 Vantage in a couple of looks: a racy look with bright, almost neon accents, and a more classic look. You can choose. Inside, the choice is made for you. 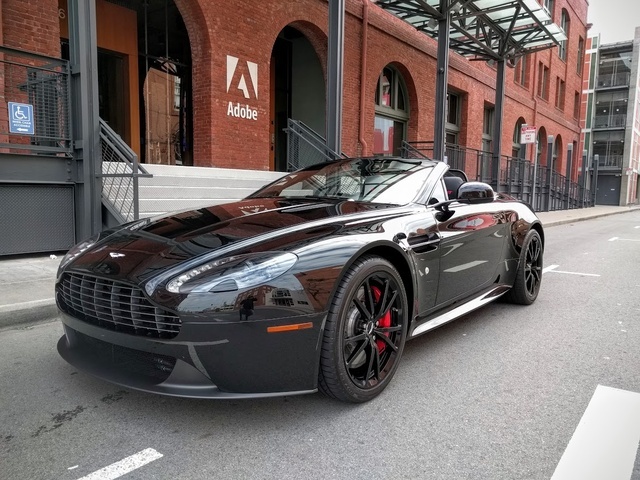 Like all Aston Martins, The V8 Vantage has a modern-classy theme, comprised of leather done right and complemented by a modern-looking switchgear with piano-black or graphite trim. The Aston Martin V8 Vantage line offers owners an exotic car experience with near-supercar performance and an entry price that seems fair. So few other models offer that. 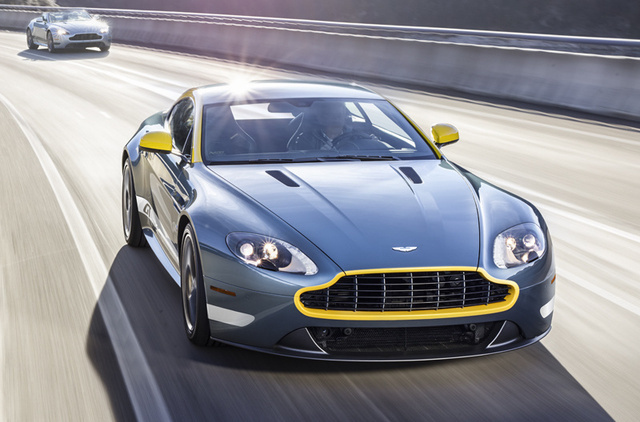 What's your take on the 2015 Aston Martin V8 Vantage? Have you driven a 2015 Aston Martin V8 Vantage?